The East Bay Modern Quilters are proud to announce our sixth annual quilt show, Stitch Modern 2017. We wish to invite everyone to our Opening Night Reception on April 7 at the Piedmont Center for the Arts. Entry is free. 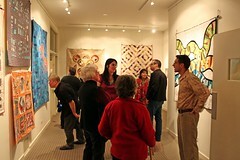 This an informal party and a great chance to view the quilts and meet the artists. The fun starts at 7:00 p.m. If you can’t make it to the opening night, the gallery will be open Noon – 3:00 p.m. Fridays, Saturdays and Sundays from April 7-April 25. We’ve also got several amazing events throughout the month. Please join us! Sunday, April 9 from noon-3:00 p.m.
Join The East Bay Modern Quilters and the East Bay Heritage Quilters for an afternoon of making charity quilts for The Children’s Quilt Project. Fabric kits will be provided, bring your sewing machine or just bring yourself for an afternoon of sewing and good company. People new to sewing are welcome! Friday, April 21, 7:00-9:00 p.m. 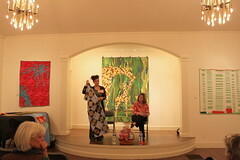 The East Bay Modern Quilters are excited to present an evening with artist Kathryn Clark (http://www.kathrynclark.com) and Founder and CEO of “Social Justice Sewing Academy” Sara Trail (http://www.sjsacademy.com) as they each discuss their work and the intersection of quilting with social justice issues. Saturday, April 22, 12:00-6:00 p.m. This year Stitch Modern is pleased to offer Maria Shell’s workshop, Making Prints Out of Solids: Line & Shapes. From her website (http://mariashell.com/classes/) the description is: Using solid colored quilters cotton, students will learn how to stitch an assortment of pieced prints including stripes, chevrons, polka dots, and pointy shapes. While learning these new techniques students will also be given information about selecting a color palette, improvisational piecing techniques, and ideas for taking these techniques and creating original quilts. If you are interested in joining us, tickets are $85. Tickets are non-refundable, however, we will do our best to refund you if there is someone to take your spot. Click here for tickets. The workshop starts at noon, so we suggest eating an early lunch beforehand; water, coffee, tea, and light snacks will be provided. Irons and ironing boards will be provided. You will need to bring your own sewing machine and a list of class supplies will be provided closer to the date of the workshop. We think this will be an informative, inspiring class and look forward to seeing you there. Registration for Stitch Modern 2017 is now open! The deadline to register is Thursday, March 23. If you have any questions about the form or anything related to submitting your quilt, contact Margaret at mcglen8 @ gmail.com. Hi, this is Claire. I’m now updating our blog. We had a great meeting tonight. If anyone took pictures that they’d like me to post, please send them to me. The online form to enter your quilts for our upcoming show, Stitch Modern will be up and running, by the end of this week. Like last year it will be $35 for each quilt entered. 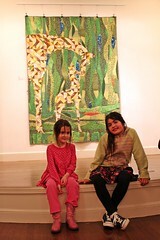 Everyone can have at least one, possibly two quilts in the show. Indicate which one is your first choice in case there isn’t room for both. The opening night party will be Friday April 7, 2017. We have two really interesting quilters coming to talk to us on Friday evening, April 21, Sara Reed, founder of the Social Justice Sewing Academy and the artist, Kathryn Clark. The main Berkeley Public Library is having their Annual Quilt Show from May 1 through June 4, 2017. Call librarian Debbie Carton ASAP at 510-981-6236 if you’d like to show a quilt. (You don’t need to live in Berkeley to be in this show). This show isn’t juried, but they don’t have a lot of room. There is room for six 6′ x 6′ quilts, fourteen 3′ x 3′ quilts, six 12″ x 12″ quilts, ten 8″ x 8″ quilts and up to 60 “postcard quilts,” which are 4″ x 6″ or 3″ x 5″. Call to find out what size(s) they still have room for. The quilts can be delivered April 22, from 11 AM – 12 PM, or April 25, from 6:30- 7:30 PM. I’m making a 3′ x 3′ quilt for this show. They usually have a lovely potluck breakfast opening for the quilters in the show, which takes place before the library opens to the public. November Meeting Update – Please Note the New Location! As announced at the last meeting, the East Bay Modern Quilters will now be meeting in a new place! 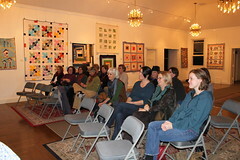 As always, on the last Tuesday of the month, the East Bay Modern Quilt Guild meeting is the place to be and this month we will be meeting at Bay Quilts at 5327 Jacuzzi Street, Suite 3-C, Richmond, CA 94804 (http://bay-quilts.shoplightspeed.com/). If you’ve never been before, don’t be shy, come and introduce yourself. Bring your latest project for show and tell or just come and hang out! Please bring your own folding chair. There are a few chairs available, but not many, so if you want a seat to sit on, bring your own. See you there! Several interesting events in June worth checking out! Come check out the quilt bombing on the Iron Horse Trail in Danville. Hosted by Wooden Gate Quilts, quilts will be hung on the fence of the Iron Horse Trail that runs near the shop. The viewing area is between Prospect Ave. and Linda Mesa from 9:30-5:30, weather permitting. This is a free arts and crafts fair with a “Quilts and Quilters” Exhibit and Sale. Two of our members, Darci and Amelia, are working on a sister sewing group that focuses on garment sewing. I have to say, we love seeing the garments our members made at our quilt meetings! However, if you want a more focused garment group, contact us and we will put you in touch with the new East Bay Stitchers group! Many of us are interested in a Bay Area – wide modern quilters meet up! Stay tuned for more details for a possible Fall meet up at the de Young. Which incidentally, will coincide with an exciting upcoming exhibit, On The Grid: Textiles and Minimalism. As always, Show and Tell was a real treat and super inspiring. I didn’t end up taking any pictures (low phone battery, dang it) but you can always check out our Flickr page, the Instagram hashtag #ebmq, or come to our next meeting on June 28th from 6:30-8:30pm at A Verb For Keeping Warm! Members: we are still scheduled to remove quilts from the gallery on 5/9 at 6PM. The East Bay Modern Quilters are proud to present Stitch Modern 2016, our 5th annual quilt show at the Piedmont Center for the Arts. 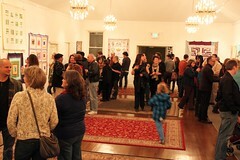 The East Bay Modern Quilters focus on modern design and personal expression through quilting. As a non-juried show, there are no hard rules – this is quilting our own way, whether it’s with the latest fabrics and traditional patterns, or free piecing with no pattern at all! We hope you will join us! Click the links below to find out more about our exciting events. *Keep up with what’s happening at the show by searching #StitchModern or check out our Tumblr! 801 Magnolia Ave, Piedmont, CA. Gallery Hours: 12pm-3pm on Fridays, Saturdays, and Sundays. **STITCH MODERN UPDATE** Due to unforeseen circumstances Stitch Modern will be closed this Saturday and Sunday, May 7th and 8th at The Piedmont Center for the Arts. Unfortunately, that means our show has ended early. Thank you, everyone! Opening Reception – Join the artists for an evening of fun, food, and celebration. Label That Quilt! – Don’t become a “Maker Unknown!” Bring your stack of unlabeled quilts and we’ll help you label them for posterity. Ideas and supplies will be provided. East Bay Modern Quilters Monthly Meeting – As always, on the last Tuesday of the month, the East Bay Modern Quilters meeting is the place to be! If you’ve never been before, don’t be shy, come and introduce yourself. Bring your latest project for show and tell or just come and hang out! Deanna Davis Children’s Quilt Day – an afternoon of making charity quilts in honor of Deanna Davis. Come and celebrate the life and passion of our friend, Deanna, by helping to make quilts for her favorite charity, The Children’s Quilt Project. This is an activity that is good for the whole family and there will be activities suitable for all ages. Fabric kits will be provided, bring your sewing machine or just bring yourself. People new to sewing are welcome! *There will also be a Girl Scout Bake sale! 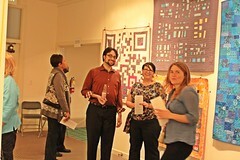 The East Bay Modern Quilters would like to thank Fried & Williams for underwriting this exhibit. 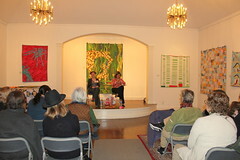 The East Bay Modern Quilters are so excited to present an evening with quilter and author Sujata Shah and artist Youngmin Lee as they each discuss their work. You can read more about each speaker below. We hope to see you there! Sujata Shah is a graphic designer, textile lover, quilter and author. She is originally from Mumbai, India and has just recently moved to San Francisco from the East Coast. Sujata finds inspiration from the textures and imperfections of handmade objects. Her exposure to different cultures has helped develop her distinctive style of quilts, which blends utilitarian and traditional quilts in an exciting way. In 2014, she published her book, Cultural Fusion Quilts: A Melting Pot of Piecing Traditions. She has just returned from a trip to India with Amy Butler where they were exploring the palaces and markets, forts and mud huts, folk artists and museums, meeting ralli quilters, embroidery artists, and block printers to learn from the best in preparation for a textile tour in 2017. She took some amazing photos which you can see on her Facebook page. 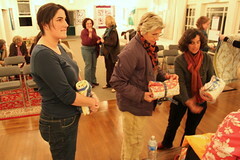 Her presentation will include a slide show of her travels in India as well as her journey as a quilter. She will also be showing original quilts from her book and share how she connects the dots between her memories of the past and today’s creative process. Youngmin Lee is a Korean-born artist who studied fashion and textiles and worked in the fashion industry before moving to the United States in 1996. She now makes work using a traditional Korean technique called Bojagi. Bojagi wrapping cloths are a unique form of Korean textile art. Lee often uses a Ssamsol technique (similar to a flat fell seam) to make her work. This technique creates a patchworked piece of cloth that is fully reversible and is traditionally used for a variety of things such as gift wrapping, covering food, and clothing storage. Youngmin’s pieces are extremely time consuming to create and gorgeous to behold. You can get a peak at her work on her website, but make sure to come to the lecture. These are pieces that must be seen up close and in person to be truly appreciated! The East Bay Modern Quilters are excited to announce that our 2016 Stitch Modern workshop will be taught by Pamela Rocco. She has been quilting for more than 40 years and received her formative training when she was in Appalachia with the Teacher Corps in 1969 and met women who inspired her to learn how to quilt. Many people are familiar with Pam through her monthly column, Words to Quilt By, in the Quilters Newsletter magazine. Her improv style is easily recognizable with her use of bright, bold, and ethnic fabrics. Pam’s quilts have been heavily influence by other cultures and she feels that her best work is often ad libbed – made up on the spur of the moment using whatever is at hand. 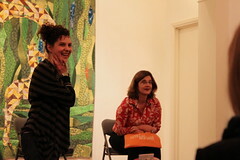 She sees quilting as a salvage art, incorporating both new and used materials to play with form and color. In her world, almost anything can be incorporated into a quilt once you learn how to see design possibilities everywhere you look. In this one day workshop, you will explore how to design an original quilt using two techniques, viewfinder and thumbnail sketching. Learning to work more intuitively and improvisationally, you will explore all the elements of quilt design to create your own one of a kind quilt. There will not be a meeting in March. Instead, the meeting has been moved to April 5th, 6:30 pm, at the Piedmont Center for the Arts to hang up the quilts for our show, Stitch Modern. I hope to see you there. A continuation of a year long exhibit featuring quilts made by the African American Quilt Guild of Oakland and Oakland community reflecting the people, environment, history, business, culture and other aspects of life in Oakland. 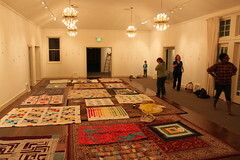 Our quilt show is almost here! Come see what our members have been up to for the past year. Many speaking events are being scheduled in conjunction with the show, so please stay tuned! For our members: the submission form is now live. You can find it here. This is sure to be a stunning quilt show and vendor mall presented by the Vallejo Piecemakers. Current member, Pati Fried, to be featured as guest artist.